As online learning continues to evolve, technologies like gamification and simulation are poised to advance student engagement and success. For those of us who have been around online education for a while and remember the DOS days, you know what I mean when I say it has been an interesting, somewhat exciting but definitely challenging journey. "Back in the day," we understood that "distance" learning referred to both the physical distance between instructor and student and the fact that something mediated that distance. My start came with "cassette" tapes and telephone when I managed a distance program for adult ESL students in Canada. Then came the internet, and we began to learn what that meant and how that could mediate the learning experience much more directly and also modify the delivery of content. Eventually the internet's inherent flexibility became obvious — and we began to call things "online," referring to the mediating of the learning experience and delivery of content, regardless of physical distance. 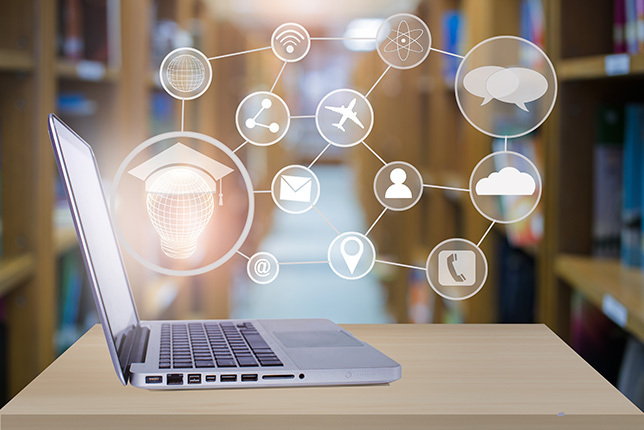 The flexibility of online learning became so appealing that it was no longer about physical locations at all but simply maximizing the flexibility in time and space. Students and instructors preferred the scheduling flexibility around which real life could still occur while programs of study were being pursued. Then complete degrees at all levels became possible. Additionally, the technology of the internet and its webbed links changed how content was organized and delivered — and altered how content could be processed by students. Then came social media and the opportunities of real-time connections. This modified our approaches in instructional design as we began to realize some content could be presented in real time, although asynchronous still provided the flexibility we all enjoyed so much. The advent of social media also changed how communication and exchange happened in society in general, and began to change the expectations of students. By this stage, wireless and mobility became advanced and changed the expectations of immediacy and connectivity for everyone. I would suggest that these were not trends specific to 2016, as they were emerging through the years along with the technology changes and developments I've briefly outlined. What has taken place more recently, however, is a clearer impact on learning and specifically the delivery, organization, presentation and engagement/interaction involved in the learning process. I would agree, though, that gamification and big data have emerged more strongly as critical aspects of full engagement with and application of learning — they are the product of new knowledge and information scope. Interestingly, back in the 90s while we were still in DOS systems, the impact of gaming was being researched by educators at the University of Toronto's Ontario Institute for Studies in Education (OISE/UT), where I completed my graduate degrees. While we had not yet the benefit of the graphical user interface (GUI), we explored the engagement of problem-solving and creative, critical thinking in completing challenges through DOS programming language. We had characters and possible movement options. Of course, the graphical technological advancements since then have pushed the ideas in gaming forward incredibly, and now it has been integrated into learning contexts and is referred to as "gamification." While we have retained project learning as a mainstream pedagogical approach, technology has advanced the possibilities and applications of the approach while maximizing student engagement. Alongside all of the changes above, we started to realize the wonderful potential of simulation software and how project-based learning could be stepped up to include practical skills training and development. With the possibilities no longer confined as much to text-based subjects, competency and skill-based education and training became its own online entity. Various professional vocation areas could now be trained online and even fully online. Do you remember when you saw the first holograms being used in the regular news broadcasts? Of course, Star Trek has taken us there many years before; however, now we could see the general use of having someone far away being "present" to discuss a topic with a newscaster. When I saw this, I realized this will eventually change everything again. While there is argument about the specific science of holograms and what we have seen thus far, it seems we are truly headed in that direction. As a higher education professional, I have travelled over the years and been involved in various educational projects using a variety of technology and delivery designs and systems. What is interesting to me is that we have not yet maximized the richness we could have with increasing connections between communities of learners from various cultures and in various subject areas. My sense is that we are still slow to engage at this global level in education. Some gamification research projects have been coordinated to include participants from around the world and subsequently, global issues such as poverty and hunger have been used as gaming challenges — and the results have been incredibly enlightening. Indeed, The World Government Summit of 2016 gave attention to gamification and the future of education. These kinds of global learning projects could really impact the development of critical problem-solving and collaboration at various levels, allowing us to think through more global problems from various cultural perspectives than could ever be possible in physical classrooms. And more resources can be shared, as individuals no longer have to physically be present in order to teach and instruct directly. Human presence and human interaction and engagement could bring advanced opportunities to students around the world — specifically advantageous for those in marginalized and under-resourced areas of the world, in terms of access to direct and effective instruction and the development of employable skills. It has been interesting, as an educator, to witness how technology has impacted teaching and learning over recent years and the speed at which changes have occurred. We do have challenges with funding, educational systems and structures, and resistance from instructors and parents who believe technology should not be leading the way. In reality, technology has and will continue to change our world and how everything is processed, organized, delivered and operationalized. I would suggest that we have always been focused on student success and achievement and the goal of helping students acquire new knowledge and apply new skills. While teachers have always been challenged to accommodate and facilitate these processes, technology has provided more efficient and effective ways for them to take place. We, as teachers and instructors, must become less intimidated by technology and more innovative with its uses in teaching and learning. My sense is that simulation, gamification and holographic technology will increase and become more user friendly, less expensive and more ubiquitous just like other technologies have done. This will mean that text-driven, linear flow and predictable designs will diminish. Our challenge is to become more flexible and value and reward innovation, design and application. Additionally, we must maximize critical thinking and problem-solving as the essential skills they are for all jobs now and in the future. "Memorizable" skills and information will be provided by robots. The human mind is what robots cannot have — and while rote activities and skills can be totally replaced by robots, humans will be required more than ever to think beyond the inevitable and design the possible. Christine Weiser (2016). Holograms go to School. Tech&Learning (www.techlearning.com). New Bay Media. World Government Global Summit (2016). Gamification and the Future of Education. In Cooperation with Oxford Analytica. Ruth Reynard (2008). 21st Century Teaching and Learning: Assessing New Knowledge. THE Journal. Ruth Reynard (2012). Understanding Mobility and its Impact on Learning. Campus Technology. Ruth Reynard (2017). Redefining Literacy in the Digital Age. Campus Technology. Ross, A. (2016). The Industries of the Future. Simon & Schuster. New York, N.Y.